Behind the scenes at the only recurring academic event devoted to J.K. Rowling's beloved novels. On a Friday in October, a handful of professors from prestigious universities like Harvard, Villanova, and Swarthmore trickled into the gymnasium of Philadelphia&apos;s picturesque Chestnut Hill College. The seated themselves around tables alongside scores of their fellow university professors, college students, and independent scholars, and waited for an afternoon of lectures to begin. It was much like any academic conference, but also not like any other academic conference at all. The event program listed lectures on the complexities of Severus Snape, and the role of Ron Weasley as a privileged ally. Strewn-about copies of the local newspaper advertised a Quidditch tournament taking place on the Chestnut Hill campus the next day. One group of young women donning capes and ties in Gryffindor colors sat together chatting. Another woman wore a witch&apos;s hat. After several minutes of quiet socializing, a bespectacled man climbed to the stage at one end of the gym and stepped to the podium. "As an academic, the one thing you can&apos;t afford is to get a reputation for being a goofball." "This may be the greatest collection of academics and intellectual thought on Harry Potter since St. Andrews," said the man with glasses, Patrick McCauley, announcing the plenary session of the fourth annual Harry Potter Conference. 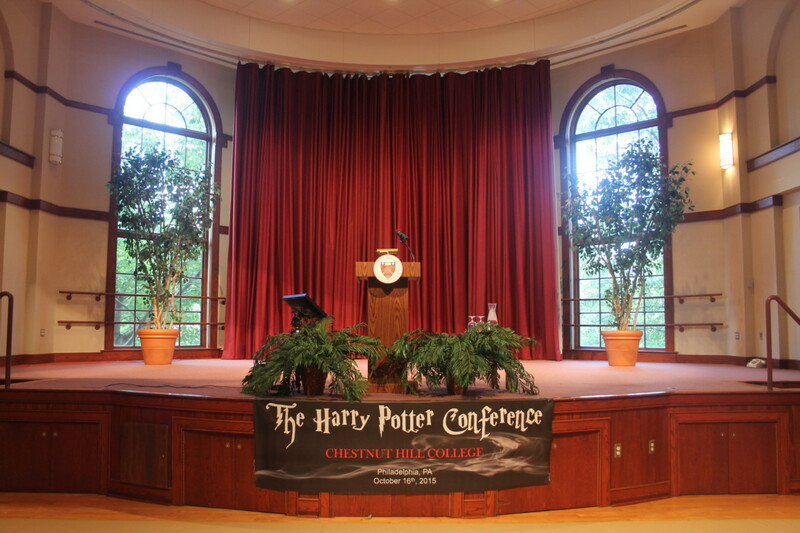 Though the University of St. Andrews held a similar conference in 2012, this gathering at Chestnut Hill has become the only recurring academic conference devoted to J.K. Rowling&apos;s work. And what had begun with a mere 30 or so participants in its first year has grown to over 200 academics and students. It&apos;s been a risk to host a Harry Potter conference at all. Scholars have shied away from Harry Potter for years, McCauley explains after the conference, which he organizes with fellow Chestnut Hill professor Karen Wendling. "As an academic, the one thing you can&apos;t afford is to get a reputation for being a goofball," McCauley says. And the priests of high culture had made clear that Harry Potter shouldn&apos;t be taken seriously. It is, after all, a children&apos;s book. A flash in the pan. But that perception is changing. Academic studies inspired by Harry Potter are proliferating—and getting more rigorous too—nearly 20 years after the release of the first book. And, crucially, the cultural gatekeepers are themselves changing. In 2000, William Safire, Philip Hensher, and Harold Bloom all wrote essays criticizing J.K. Rowling for her prose and plot, lamenting what Hensher described as "the infantilisation of adult culture." Even so, Bloom predicted, "cultural critics will, soon enough, introduce Harry Potter into their college curriculum ... another confirmation of the dumbing-down it leads and exemplifies." The decade that followed was tough for academics who wished to study the series. As renowned Potter scholar John Granger, who runs the website Hogwarts Professor, explains, these were "Potter panic" years. "There was this scramble among academics to say that these books were horrible," Granger says. "The best thing to happen to Harry Potter was Twilight because then there was a new whipping boy." Even for those who valued the books, there was some fear that Rowling might falter in the last book, proving her critics right in the end. So when the prestigious University of St. Andrews in Scotland put out a call for papers discussing Harry Potter in 2011, the organizers anticipated the dismissive responses that were sure to come. "In public intellectual culture for the past 200 years, there&apos;s always been a line of criticism which will sneer a bit at children&apos;s literature," says John Pazdziora, who organized the St. Andrews conference. Fantasy literature prompts the same reaction. "Harry Potter is children&apos;s fantasy literature," he says, "and it gets it from both ends, quite frankly." James Thomas, an English professor at Pepperdine University who teaches Harry Potter, most succinctly explained the aversion to the books in an interview back in 2009. Harry Potter, he suggested, suffers from the three deathly hallows of academia: "[T]hey&apos;re too recent, they&apos;re too popular, and they&apos;re too juvenile." Members of the British media reacted with horror in 2012 when St. Andrews hosted the conference, which was titled "A Brand of Fictional Magic: Reading Harry Potter as Literature." The Daily Mail described the event as "blatant pandering to spurious zeitgeist gimmicks," while the Guardian took a more measured approach, quoting an English professor who said Harry Potter is "for children, not for grownups." The Telegraph, meanwhile, was having none of it: "As the first Potter literary conference draws to a close, let&apos;s hope the delegates have learnt something," wrote Telegraph columnist Sarah Rainey. "J.K. Rowling may be a great storyteller, but she&apos;s no Shakespeare. Her books, though enthralling, weren&apos;t written for academic study. It&apos;s an injustice to Britain&apos;s true literary greats to pretend otherwise." Still, scholarship carried on. For some professors, the reason to teach Harry Potter in college courses is obvious: Students actually want to learn in their classes. 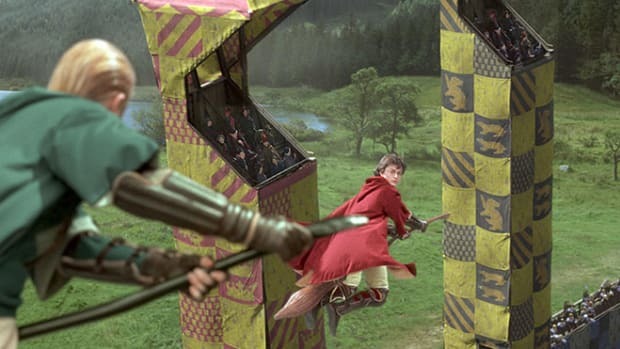 In the interdisciplinary studies that employ Harry Potter in their courses—science, religion, philosophy, and psychology among them—the books are generally used as a jumping-off point to help students understand complex concepts and get them interested in the contours of the academic subject. At Chestnut Hill—whose main hall looks a bit like the towers of Hogwarts with its French-Gothic exterior—the bespectacled McCauley and Wendling jointly teach an honors science and religion seminar that delves into quantum physics and theology before ending with a Harry Potter capstone. The idea is to apply all the traditional material gleaned throughout the duration of the course to the fantasy epic novel. Harry Potter is used as a tool to keep the class from tipping too much toward either science or religion, McCauley tells me. For example, magic is morally neutral in the world of Harry Potter; spells become good or bad based on the intent of the witch or wizard. "Much like science, it puts the ethical or moral burden on the practicer to decide if they&apos;re going to perform certain experiments and the consequences of that on the rest of society," Wendling says. "I don&apos;t think there&apos;s a huge number of colleges who are running to put together a Harry Potter conference because of that still-real fear of what might happen." Harry Potter is considered a gateway as a literary text too. Despite the disdain of critics, there&apos;s much to learn from Rowling&apos;s writing technique, says Maria Tatar, a noted folklore scholar and professor at Harvard University. Rowling grew up with British literature, Tatar points out, and her work is deeply connected to that of Jane Austen and the Bible, in addition to all the allusions to alchemy and science. "Rowling is almost training you in the art of literary interpretation," Tatar says. That much was clear in Room 314 of Chestnut Hill&apos;s Martino Hall. In one of the conference&apos;s breakout sessions earlier in the day, independent scholar David James Gras delivered a lecture examining Phoenix/resurrection themes in both Harry Potter and the Hunger Games series. Just as the Harry Potter series was the crucible for the purification of Harry&apos;s soul, Gras argued, so too did Katniss Everdeen&apos;s journey in the Hunger Games represent a spiritual awakening of sorts. At the end of the lecture, a blonde, college-aged woman wearing a leather motorcycle vest, khakis, and boots raised her hand. But the woman didn&apos;t really have a question. She had a point to make. Katniss, she said, may have been the savior figure, but she was also a broken character by the end of the books. That&apos;s a very different kind of cleansing than that of Harry Potter, she said. Rather than brushing the woman&apos;s argument aside from his position at the podium, Gras listened. McCauley knows this scene well. Two-thirds of the winners of the conference&apos;s high school essay contest were women. All of the students in the Chestnut Hill honors class are women. Maybe it&apos;s because of Hermione Granger&apos;s strong feminist influence in Harry Potter, he says, "Women aren&apos;t just piping up at the end of the conference. Women are the dominant voice." And these voices are thoughtful. The papers that students write each year about not just the books, but also science and religion, is what inspired the creation of the college&apos;s Harry Potter Conference four years ago. 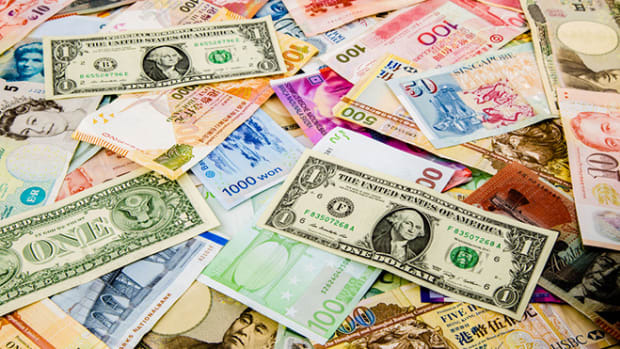 And yet, despite the conference&apos;s growing popularity, McCauley thinks change is slow-going. "I don&apos;t think that the tide has turned," he says. "At this point, I don&apos;t think there&apos;s a huge number of colleges who are running to put together a Harry Potter conference because of that still-real fear of what might happen." The possibility of being taken for an intellectual lightweight permeates academic institutions. Dissertation advisers nudge their students away from less serious-seeming theses; others who have researched a topic like Harry Potter may refrain from listing it on their résumés. That&apos;s why, despite a proliferation of Harry Potter-related research in recent years, the field is still fighting for legitimacy. While many colleges and universities offer classes drawing from the Harry Potter texts, most of these are "second-tier schools," Granger notes. But that&apos;s starting to change, due in large part to time. Film studies wasn&apos;t considered a legitimate field a few decades ago either, Tatar says, but today "you wouldn&apos;t think twice" to advise a student writing a dissertation on Quentin Tarantino. By now, the generation that read Harry Potter as children and teenagers are old enough to be professors. When they have tenure, theoretically they will be more supportive of their own students who want to pursue a Harry Potter-related dissertation. 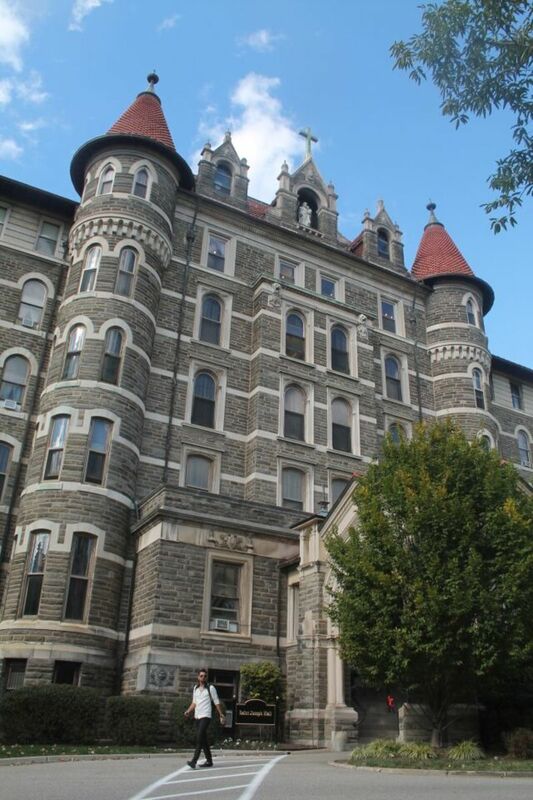 It&apos;s crucial that McCauley and Wendling find a way to prove the legitimacy of Harry Potter as they organize Chestnut Hill&apos;s Harry Potter Conference. Speaker selection is rigorous; Wendling says they regularly turn down papers that devolve into fandom rather than focusing on research. "We have been relentless in our guarding of the seriousness of our event," McCauley says. McCauley says that Tatar played a particularly important role in reinforcing the rigidness of this year&apos;s conference with her plenary speech. Sure, she is a well-respected Harvard professor, so there&apos;s that. 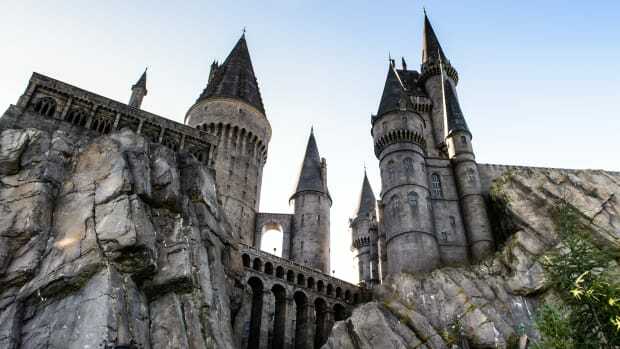 But more importantly, she was able to connect the wizarding world to more traditional fictional worlds like Narnia, Wonderland, and Neverland. Of course, it&apos;s not like that link is a guaranteed means to legitimacy; children&apos;s literature as a whole isn&apos;t always well-received. "It&apos;s almost like a love/hate relationship that we have with children&apos;s literature," Tatar says. Years ago, she directed a thesis on Disney female villains that was nominated for a prestigious award at Harvard. The prize committee consisted of about 40 of Tatar&apos;s colleagues. "When the title of that thesis was read out, every hand in the room shot up. Everyone wanted to be a reader," she says. "So we love this stuff. And yet these are the same colleagues who, when a student comes to them and asks, &apos;Can I write on this?&apos; they say no." But Tatar believes that Harry Potter is more an object of mass culture than pop culture. Where pop culture is ephemeral, she explains, mass culture is transformative. And while popularity usually works against the perceived seriousness of a piece of literature, the commercialism of the Harry Potter world (best exemplified by its theme parks) might actually legitimize it. "You can&apos;t pretend it&apos;s not there," Tatar says. "You can&apos;t dismiss a cultural phenomenon that is that powerful." That power will, over time, translate to academic legitimacy. "I think we will reach that point where we realize that what we love and what we read as children is perfectly acceptable as an object of study," Tatar says. "Why would you not want to study this?" To be sure, scholarship related to Harry Potter continues to grow. In February, McCauley and a few other academics—including the University of Colorado&apos;s Christopher Bell, who leads the Harry Potter section at the Southwest Popular/American Culture Association—will launch an interdisciplinary academic association devoted entirely to J.K. Rowling&apos;s works. Back at Chestnut Hill, University of Modena and Reggio Emilia researcher Loris Vezzali peered into the gymnasium from projector screens on each side of the stage. Sitting in front of a bookcase in his home in northern Italy, Vezzali apologized for joining the conference by Skype. He would have traveled to Chestnut Hill, he said, but his wife was having a baby that day. 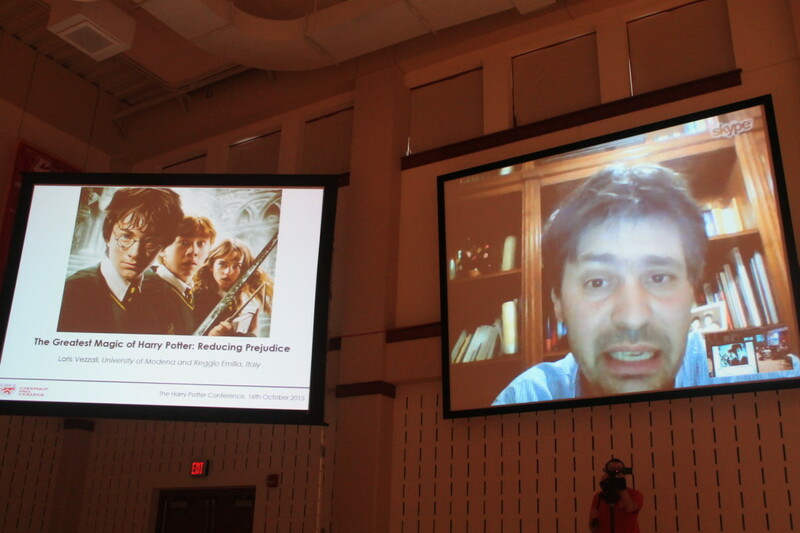 Vezzali was explaining to the conference attendees the results of his study—titled the "Greatest Magic of Harry Potter: Reducing Prejudice"—which made international news earlier this year. The study, composed of an experimental intervention with elementary school children as well as two cross-sectional surveys of high school and university-level students, examined the influence that reading Harry Potter had on students&apos; attitudes toward disadvantaged groups, including immigrants and refugees. Of course, immigrants and refugees are not house-elves and giants, Vezzali admits. But those stigmatized groups within the Harry Potter universe help readers relate to the stigmatized groups of the real world. Fantasy books, he said, have a special role in reducing prejudice—any existing bias a reader has toward a particular group is not activated by the surreality of the fantasy world. If you don&apos;t activate that initial resistance, the book&apos;s lesson has a better chance of getting through. That&apos;s exactly what Vezzali&apos;s study found among all three subject groups. Research like Vezzali&apos;s is important to scholars like Karen Wendling. That study is going to be the first she cites in arguments with those who would otherwise dismiss the series, she says. "It&apos;s real evidence Harry Potter is doing good beyond the books themselves," she says. That&apos;s evidence that even some Harry Potter skeptics are believing. McCauley says his colleagues at Chestnut Hill have been approaching him in the hallways ever since the conference, apologizing for not having taken the books seriously before, promising him they&apos;re on board now. What changed their minds, he says, was simply finding out what Harry Potter scholarship encompasses. "You kind of have to be there." Fans aren't the only ones under the spell of the seven-tome series. Academics at non-Hogwarts institutions find a great deal to study as well. In this edition of The Cocktail Napkin, we look academics' fixation on the social and economic problems in the world of Harry Potter, and how music festivals impact the psychological and social well-being. 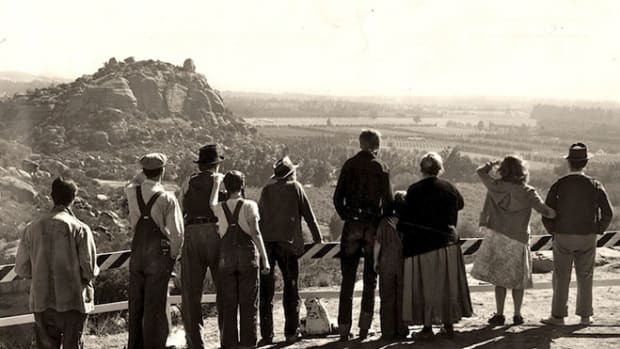 Seventy-five years after its first publication date, The Grapes of Wrath is still a staple in most American classrooms. Is that because we haven’t yet written anything that does a better job of portraying the devastation of not having enough?